Chapter 5: "Rasputin Must Die!" The search for the Queen of Witches finally ends when the Dancing Hut travels to Baba Yaga’s homeland of Russia on the planet Earth. The year is 1918, and the First World War rages throughout Europe. The heroes find themselves in the wilds of Siberia, where they must face Russian soldiers armed with twentieth-century technology to infiltrate an ancient monastery and rescue Baba Yaga from her estranged son, Grigori Rasputin. Can the heroes kill the “Mad Monk”—who has already cheated death once before—and free Baba Yaga, or will they fall before the horrors of modern war? 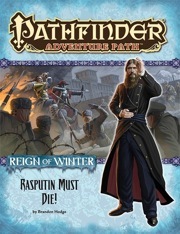 “Rasputin Must Die!”, a Pathfinder RPG adventure for 13th-level characters, by Brandon Hodge. Rasputin Must Die! is sanctioned for use in Pathfinder Society Organized Play. The rules for running this Adventure Path and Chronicle sheet are available as a free download (639 KB zip/PDF). I had been looking forward to this one simply on account of the title. I have to say that the story elements and the setting were top notch. Where we all found it lost points was just how overpowered we found most of the fights. Even for experienced players we found them too difficult for the levels. Everything about this book - from Brandon Hodge's introduction to the back-matter to the inside-cover items - was a joy and a pleasure to read! This is, by far, my favorite book/module/scenario/AP to have read and GM'd - slightly edging out "The Flesh Collector" PFS scenario, even! My players were having so much fun with this book that I purposefully dragged out RP and certain sections of it so the book took us longer than any of the others, and they loved every minute of it. actually all of them are perfectly harmonized without way over the line. Rasputin must Die! is definetly top of the adventure path line. Brandon Hodge was definitely the best choice for this adventure. He expertly handled historical content and mixed the fantasy with real world elements in a way that enhanced the story. I love this adventure and he it gives me hope for seeing more boundary pushing content from Brandon and from Paizo as a whole. I admit when this was first announced I was at best sceptical of the entire idea however having read and Dm'd it I can say I have never been happier to be completly wrong about a product before. Ths is an incredible adventure path instalment and I cant recomend it enough. Also, "Oh yes, we did." YES! I cannot wait for this. I don't think I've ever been this excited for an RPG book. Words cannot describe how excited I am for this. I love that Earth is Baba Yaga's birthplace. a new occult oracle mystery based on 20th century mysticism! Rescue Baba Yaga? That's interesting. I'm leery of "The year is 1918, and the First World War rages throughout Europe. The heroes find themselves in the wilds of Siberia, where they must face Russian soldiers armed with 20th-century technology", but it could well be sufficiently isolated to not bother me. Hmmmm. 1918? Rasputin is theoretically dead by then. The Tsar has been deposed, though he might still be alive and imprisoned depending on the date. The Revolution has happened. Russia's in the middle of a civil war, as well as the Great War. I'm not sure exactly what would be going on in Siberia or whose those solders would be. The product description explained that Rasputin has already cheated death. This ain't your History Books' Earth. Plus, do I detect foreshadowing that The Horseman of War was behind WWI? Once again proving that while Pathfinder RPG IS pretty awesome, it's the Pathfinder Adventure Path line that drives the brand. Looking forward to this one James! Oh, I wasn't complaining about Rasputin not being dead. It's what he does. Just trying to place where it is in the timeline. And it should be my History Books' Earth. Otherwise what's the point. Of course, not everything makes it into the history books. If anybody can pull this off Brandon can, From Shore to Sea has to be one of Paizos best modules. I love Diesel Punk and I can see myself basing a home brew game based on an invasion of earth from Irisen. Wow didn't see you rescueing Baba Yaga, or that Rasputin is her son. But I am very happy about going to world war I russia. This. This adventure right here makes me want to run this Adventure Path. Ballsy as F*CK!!! I am SO SO SO SO looking forward to this!! 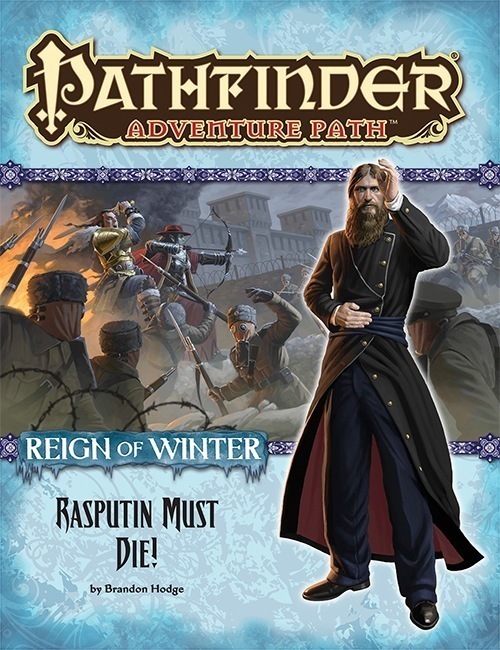 It's a pulpish version of 1918 Europe, where not only is Rasputin alive but he probably has magical powers. Unlike you know, real life. Of course, not everything makes it into the history books. Call me skeptical...First thought I had was "Jumping the shark a bit too hard." But I will wait and see, I am always pleasantly surprised by the AP. Artwork of Lem driving a Renault FT-17 tank or I start a Monk thread. All this excitement makes me very happy. I gotta admit I expected more grumblers, but I'm pleasantly thrilled with the response so far. To be fair many of us who are weary of the idea already voiced it in the item card and the Rasputin must die thread. Tanks were first made in WWI. Russians didn't have them in 1918. No Lem inna tank. Russians were probably still using cavalry or locomotives to get around. Now, Lem heading a coal locomotive I could see. I'm glad all this is finally out in public... it was getting nerve-wracking staying silent! But yeah... in a lot of ways, it's THIS adventure that really made a lot of us decide to build the Reign of Winter adventure path the way we built it. It's certainly the adventure in the series that I'm most excited to see! As for "jumping the shark," we'll see. I think we've got a pretty excellent record by now of taking risks with plotlines and elements that might be considered "shark jumping" (such as Distant Worlds, the robots in Inner Sea Bestiary/Dungeons of Golarion, an all-pirate adventure path, an adventure where you all play goblins, a book all about cryptids, a book all about monsters that we as gamers have spent the last few decades mocking, etc.). I'm relatively sure that "Rasputin Must Die!" will end up being SUPER AWESOME. Those who worry that it's going a place that they might not want... this element is really nothing new for Baba Yaga themed adventures from previous editions of the game—she's ALWAYS had elements of Earth involved with her. Furthermore... the fact that she's (as far as I know) the only non-deity character from Earth mythology that we've significantly incorporated into Golarion means that we more or less HAD to have Earth ties. That all said... the method by which the PCs reach Earth is via Baba Yaga's hut. That means that this is going to be pretty self-contained. Don't expect to see relatively contemporary Earth stuff like tanks and Russians showing up again in Golarion stuff (unless this adventure ends up being so popular that you, the paying customers, demand such) anytime soon. Tanks were first made in WWI. Russians didn't have them in 1918. No Lem inna tank. This is actually totally inaccurate in any case. "Tanks in World War I were developed separately and simultaneously by Great Britain and France as a means to break the deadlock of trench warfare on the Western Front. Their first use in combat was by the British Army on September 15, 1916 at Flers-Courcelette, during the Battle of the Somme. The name "tank" was adopted by the British during the early stages of their development, as a security measure to conceal their purpose (see etymology). While the French and British built thousands of tanks between them, Germany developed and brought into service only a single design the A7V producing 20 vehicles due to lack of capacities or resources." In Soviet Russia, the so-called armoured forces (броневые силы) preceded the Tank Corps. They consisted of the automated armoured units (автобронеотряды) made of armored vehicles and armored trains. The country did not have its own tanks during the Civil War of 1918-1920. In January 1918, the Red Army established the Soviet of Armored Units (Совет броневых частей, or Центробронь), later renamed to Central Armored Directorate and then once again to Chief Armored Directorate (Главное броневое управление). During the Russian Civil War of 1918-1920, the Nizhny Novgorod Machine Factory built armored trains, armoured carriages, and weapons for the vessels of the Volga Military Flotilla. In 1920, the factory remanufactured fourteen burnt-out French Renault FT tanks for the Red Army, the Russkiy Renos, and assembled a single new copy, named 'Freedom Fighter Lenin'." Note, no tanks from 1918-1920. Now, if you are saying they might have imported a handful of tanks from Britain and France, yes, that is true. but there weren't any Russian tanks around. In short, no, that statement was completely accurate. Where are you getting your misinformation from, Brandon? Lem at the helm of a steam locomotive still sounds pretty rad. So saving Princess/(unknowing White Witch) Anastasia is still on the table! "Russia didn't have tanks" isn't the same as "Russia didn't have Russian-developed tanks". The Allied intervention brought tanks with them. There were British, Canadians, Australians and Americans in Murmansk and the north west of Russia There was also a 7000 strong force of Americans in Siberia. The Japanese (who were on the Allies side in WWI) also had 70,000 troops "helping" in Siberia as well. I just might jump ship on Kingmaker and run this!!!! Bring It!!!! Who's the spooky looking guy on the mockup cover? I don't recognize the illustration. There is a picture of a captured British Mark V Tank in Arkhangelsk in Wikipedia. I'm really, really looking forward to this but I need to ask a question... so folks are ok with the PCs traveling through time and space in a hut with chicken legs to rescue her from her estranged son who has survived death on Earth but tanks appearing "too early" is right out? I'm so happy and excited for Brandon! "What do you mean the players are going to hijack the Hut?!?" All of Reign of Winter is one big roller coaster. People are not going to want to miss this one. Perhaps you are for to designing most feared beasts of Russian legend: talkingk moose and flying squirrel? We SO wanted to use Tunguska, but the timing was problematic. I like Rasputin. Him and Blackbeard pretty much prove 100 h.p. people.